The Kurrawa Lodge is a holiday makers dream. 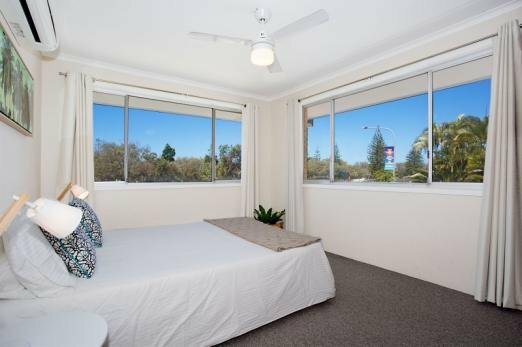 Air-conditioned with two bedroom located in the sought after Broadbeach location directly opposite the park & beach. Close to all major shops & transport this unit is ideally situated, and comes with sea breezes and slight ocean views from the lounge and balcony and just note there is a patrolled beach and the Kurrawa Surf Livesaving club just across the road. The Kurrawa Lodge is furnished with one queen bed, two singles and a sofa lounge and features a microwave, fridge and oven. There is a combined bathroom and laundry with a washing machine / dryer and separate toilet. The lounge has views of the park and some glimpses of the ocean, there is a single carport underneath. Please read your final confirmation and arrival instructions email from Holiday Accommodation for full access instructiuons.